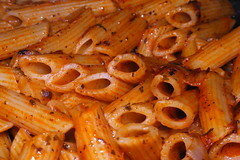 Image by davide.santoni via Flickr Image by HatM via FlickrThe Italian food culture concerns not only what we see at Italian tables or in a rich Italian restaurant menu. It is something much deeper in Italians’ DNA. There’s a traditional pasta sauce recipe from Roma region called Pasta all’amatriciana (it’s a tasty sauce made with tomatoes and bacon). Usually it’s served using the bucatini pasta (kind of huge spaghetti with a hole in its middle). An Italian woman was disgusted hearing her hairdress telling her colleague that preferred it with short pasta. She said: “Don’t ask me why. It is just as it is. Amatriciana must go with long pasta. How can one imagine cooking it with short pasta?” The same goes for pasta with oil and garlic (aglio e olio), you probably will never see it served using any other pasta that isn’t spaghetti. A lot of people around the world drink coffee and milk. In Italy, people use to drink cappuccino – a coffee and milk with addition of milk foam. All around the world people drink coffee and milk whenever feels like doing it. Italians will never ask for a cappuccino in the evening! Why? It is just as it is. It’s not time to have a cappuccino. Cappuccino is for breakfast! Italians do not accept someone who asks a cappuccino after, or even worse, together with dinner. They really twist their nose when they see someone doing it. In Italy there are bars everywhere. There are many small cities, having about 1,500 inhabitants that have about 20 bars. It happens because drinking in Italy is associated with greetings. When an Italian meet a friend, it’s natural to “drink something together”. If it happens to serve a drink to someone seat besides you, never turn the jar or the bottle against the natural way of your hand. For example, if you have the jar in your right hand, the glass must be on the left side, never behind, on the right side of your right hand. Otherwise it may not bring good luck. In many countries it’s common to eat a salad as entrance. Italians eat salad as a side plate for the second dish. Now you can find some tourist restaurants in main cities that propose rich salads for the tourists…but Italians never ask for them! Italians respects lunch time. If you come to visit Italy and want to have lunch, pay attention to restaurants’ closing times. Usually after 2:30pm the kitchens are all closed and you’ll have to eat a sandwich. If an Italian is travelling outside Italy, he will probably look for a restaurant during lunch time. If he doesn’t or cannot find one, and finds one at 3:00pm, he’ll probably say that is not hungry anymore, that he uses to eat at that time otherwise he loses his hunger. The interesting in all these is that they don’t do it for being presumptuous, but they really believe you’re wasting your taste. Italian culture still has a lot of “musts” that go with generations that just follow it without knowing why it is done in this or that way. Ana Maria da Costa, economist and enogastronomic expert, lives in Italy since 1983 and shows Italian food culture from the inside, with tips and useful info in her website All about Italian food.